::::::: Although we are fond of children, THIS cottage and SETTING are NOT conducive for families...I have another wonderful FAMILY home called the CYPRESS RITZZ which is nearby the Green GEcko. ::::::::ask me about that for families. be without the neon lights and commercial stuff... this adorable two-story cottage is the ticket! Situated on a spacious lot with natural vegetation, including palmetos and water oaks, you will feel the magic and calm of the old Florida Spirit. A Coastal Cottage... with hardwood floors, vaulted ceilings, white-wood walls, and a half bath on first level. Kitchen is fully equipped and open to the lofty living room where you can relax with a book or watch your favorite movie. Bedroom is upstairs and is a good size with a KING Bed with a comfortable chair..a full bath, and French Doors opening to a Juliet balcony where you can experience the surrounding Cypressheads while enjoying your morning coffee or just plain relax. This interesting cottage adjoins the Top'sl Wildlife Preserve and is just a few blocks from the beach, however, because of the Preserve, you cannot walk directly to the beach and you CANNOT see the water. Built in 2002, this cottage invites you with its soothing, new, and clean lines. Beach access is just a short distance and you can bike to Grayton, Blue Mountain, Watercolor, Seaside, and Rosemary Beach on the new Bike Trail which you can access from our drive. We are within driving distance of Atlanta, Memphis, Nashville, Birmingham, New Orleans, and yes, even Tampa... Southern Florida likes us too! I am a Realtor and my husband is a 'rocket scientist'... Prior to heading to the beach I was a Realtor for years in Nashville and Franklin Tennessee. We love living here, it is like being on vacation all the time. I purchased this location when I first moved to the beach, and decided to build myself a cute private little cottage so that I will have something when I retire....but I might never retire because I also purchased a great spot in Seaside where I live and own a little gallery and toy store...So I decided to share this adorable house with others who also feel the magic of this special place within easy biking distance to the beach adjoining the wildlife preserve. When I found this quiet street and private lot, and began building the cottage, there were many green geckos sunning on the boards, so my kids said...why don't you call it the Green Gecko....We have kept it varying shades of green since it was built. Fully equipped...coffee grinder, toaster, microwave, dishwasher and tons of pots and pans to make a gourmet meal if you wish. Two decks, one on the top level off of the master bedroom and one large deck on the lower level with table and chairs for outside dining. Adorable house! Great place that has everything you need. Quiet stay surrounded by pine trees. Would stay here again. Bert was informative, prompt and a great hostess! I loved this cottage. It was perfect for my husband and me to get away and spend a few days having fun and relaxing. It's not that far from the beaches, maybe a 5-10 minute drive or to the area restaurants. A few things need to be updated but I will definitely book this cottage again. I would recommend this cottage to family and friends. This was a very good rental for a short-term stay in Santa Rosa Beach. The property was clean, quiet, and the pictures were an accurate representation of the property. It is also only approximately a 3 min drive or 15 bike ride to Santa Rosa Beach. Perhaps we got lucky, but we had no problem finding parking along Route 30A when going to the beach. The property is also not far from Route 98 - and hence near many supermarkets, WalMart, pharmacies, etc. As for the interior, the upsides were that the cottage was nicely decorated - and, in particular, the bed and couch were very comfortable. The downsides - the shower and upstairs bathroom is a bit dated and there is very limited kitchen supplies, so anyone who wanted to cook extensively would have to purchase a lot of spices and ingredients. The stove was also not great. Those few nits, I would definitely stay here again! My Girlfriend and I really enjoyed our stay, the pool was Great hot out side cool in the pool 😁 The owner Burt was friendly the home was much better than most condos Great setting quit peaceful Perfect ! John, thank you for taking the time to write a review. We are glad you enjoyed my little treasure the "Green Gecko". I call it the magical place . Please return and let me know you are a returning guest for a returning guest discount. We had a great time. The cottage was the perfect size and had all the amenities you could possibly need. The bed was very spacious and comfortable as well. 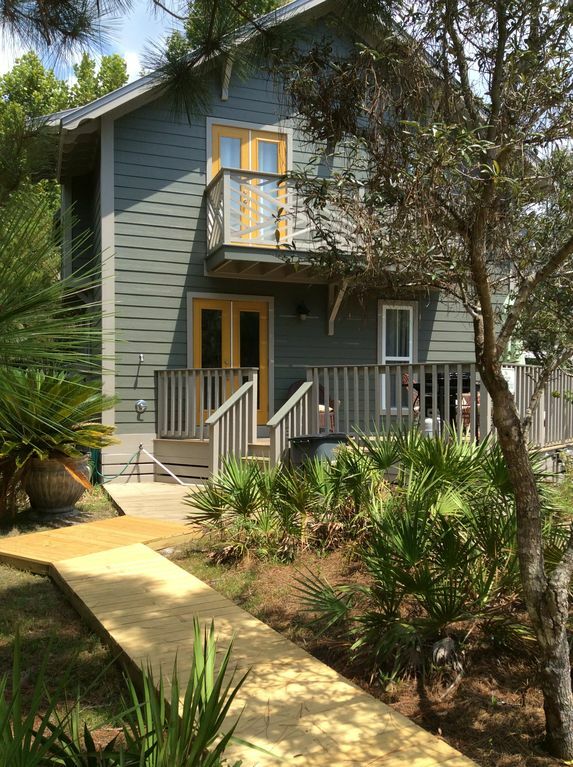 I would certainly recommend this property for those staying on the Emerald Coast. Great cottage---- super alternative to a condo for relaxation and priviacy. Nice accommodations- much better option than dealing with parking decks and riding elevators in a condo complex. Very secluded and quiet-- well worth the compromise of not having a gulf view. Beaches are easy enough to get to, even with the crowds on the 4th holiday week. David... what a nice review, I love especially that you get it! I know so many folks want that water view, and I understand, but if you can have a quiet relaxing place where you can easily get to the beach, that is what a true vaca is all about............ please return, and let me know you are a returning guest for a returning guest discount..